Vietnamese police forcibly dispersed an anti-China rally on Sunday and arrested at least 10 people, including journalists, after a series of protests over tensions in the South China Sea. Plain-clothed security agents moved in to detain the small group of demonstrators almost immediately after they gathered within sight of the Chinese embassy in the capital Hanoi. An unprecedented series of protests -- which are not common in authoritarian Vietnam -- had taken place peacefully in Hanoi over the past five weekends during an escalating maritime dispute in the South China Sea. China and Vietnam have been at odds over the potentially oil-rich Paracel and Spratly island groups, which straddle vital commercial shipping lanes. While Vietnamese authorities allowed the earlier public protests as a means of expressing displeasure with Beijing, analysts said, they are now reining in the demonstrators after holding talks with China on the dispute. The arrests came about two weeks before Vietnam's communist-controlled National Assembly convenes after nationwide one-party elections in May. The Assembly is expected to confirm another five-year term for Prime Minister Nguyen Tan Dung, who is believed to be supported by the powerful security apparatus. Protesters struggled on Sunday morning as the security men led them onto a public bus, which had been on standby, and took them to a police station. "We did not do anything!" they shouted. Among those detained was a Vietnamese cameraman for Japan's NHK television who, his company said, was later released. The Associated Press reported that one of its Vietnamese cameramen was held but freed after questioning. A Vietnamese working for another foreign news organisation was also detained in the round-up but was later seen leaving the police station, media sources said. The Committee to Protect Journalists, a US-based watchdog, said it was "troubled" by reports that journalists had been detained. It said they were "being punished for just doing their jobs". Police refused to comment but a witness saw several protesters being released from the station later Sunday. 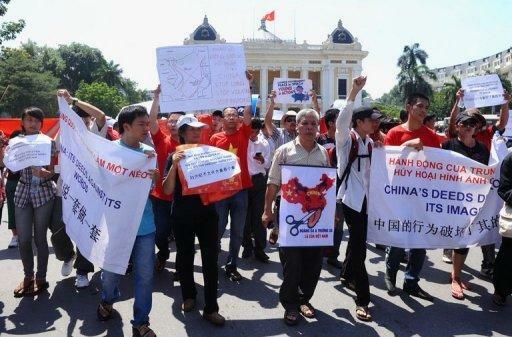 Tensions flared and protests began in late May after Vietnam accused Chinese marine surveillance vessels of cutting the exploration cables of an oil survey ship inside Hanoi's exclusive economic zone. The first Vietnamese rally drew close to 300 people, but after that numbers dwindled to about 100. Some protesters felt their actions were "in vain" after China and Vietnam held talks on June 25 in Beijing, one activist said. At the meeting, both sides agreed to resolve their territorial disputes peacefully. Beijing and Hanoi "also laid stress on the need to steer public opinion in the correct direction", the official Vietnam News said. That meant Vietnam must get a hold on the demonstrators, while China should control its media, whose comments on the maritime issue upset Hanoi, said Carl Thayer, a long-time Vietnam analyst based in Australia. Before arresting the group in Hanoi, police warned protesters through a megaphone "not to complicate the situation" and to leave the area. Analysts say Vietnam has to balance its relationship with China by not offending its giant neighbour while also avoiding appearing weak before its own people, who have a long-standing dislike of the Chinese. The top US military officer, Admiral Mike Mullen, was in China on Sunday for talks set to include stability in the South China Sea. The Philippines, Brunei, Malaysia and Taiwan have all made claims to the Spratlys and tensions have risen this year between Beijing and Manila over the issue.